Unfortunately, more people want to do the Death Ride than the highway patrol will allow, and it's become very difficult to get in. The last time I got a spot was in 2005, and my brothers were either turned away or had made other plans. None of us has ridden it in years. Thus, it is purely out of a selfless interest in helping others—those very people who got spots when I didn't—that I write these Death Ride Frequently Asked Questions. Q. I’m signed up for the Death Ride, and it’s in just three days. I’m starting to have second thoughts. How hard is this ride, really? A. If you managed to get registered, that’s really the hardest part. After braving the Active.com server crashes, getting your money back for that expensive subscription Active.com slyly signed you up for, and of course prevailing in the lottery in the first place, the ride itself is practically a formality. Q. Should I go to Markleeville Death Ride early to try to acclimate to the altitude? A. In my experience, acclimating takes so fricking long there’s no point, unless you wanted to live in Tahoe for 4-6 weeks. Also in my experience, the altitude isn’t a big problem unless you’re trying to hammer. If you’re pacing yourself properly, you shouldn’t break through the dreaded “invisible ceiling” where you go from being conversational to gasping for breath in two minutes after a slight acceleration. Q. How about carbo-loading and hydration? A. Carbo-loading is a great idea—not just in the few days before the race, but year-round. As for how to carbo-load, most endurance athletes stick to what they know: pasta, rice, cereal. And water is as fine a fluid as any other typical beverage. But for an intense night-before carbohydrate load, you might try TwinLab's Carbo-Fuel, a beverage that has 60 grams of carbohydrate per eight-ounce serving. A liter or two or this will not only top up your muscle glycogen stores, but will also hydrate you and help induce a soporific blood sugar stupor—an excellent way to get the sleep you need the night before the event. 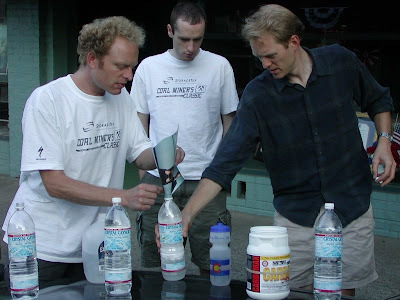 Here, Geoff, Bradley, and I mix up some (off-brand) carbo-fuel on the hood of the car on the way to Markeeville. Q. Does beer also count as both a fluid and a carbohydrate source? A. It counts as a carbohydrate source, but because alcohol is a diuretic, it actually depletes your fluids and should not be consumed the night before the ride. Q. But what about that great German beer, Meister Brau? A. That brand of beer should never be consumed, except under dire financial circumstances, such as college. Q. Do I need to bring Powerbars with me to Markleeville? A. No, the Death Ride event coordinators will provide all the food you will need, in addition to Cytomax, the miracle sports beverage with lactic acid buffers. Q. I’m conflicted about carbo loading, because I’m on Atkins. What should I do? Q. You seem to be talking a lot about diet, digestion, consumption, and such. Why all the hullabaloo? A. I’m pretty obsessed with food in general, and try to work it into everything I talk or write about. Beyond that, it’s said that an army travels on its stomach—and so do Death Riders. The stomach is perhaps more important than the heart, the lungs, or the legs. If you can digest 8,000 calories while riding, maybe you’ll be able to finish. 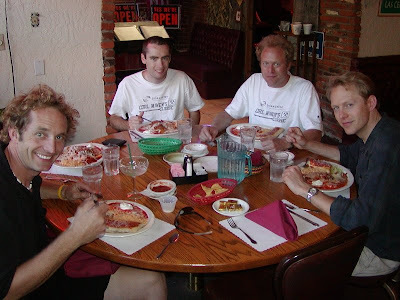 Here, Max, Bradley, Geoff, and I tuck into a pre-ride Mexican Extravagaaaaaanza dinner at some place in Placerville. Q. Wow. Eating a lot sounds really important. Does that mean if I have a bad stomach, or start to feel nauseated, that I should just pack it in? A. Of course not. Consider Jacques Anquetil, a cycling hero from the early days of the Tour de France. While climbing the famous and brutal Col du Galibier in 1958, he had dysentery and was spitting blood and vomiting by the finish. If he can handle that, you can surely keep down your Powerbars and Cytomax and make it over half a dozen little American hills. Q. What does that say about Anquetil’s stomach? A. It says more about his incredible determination than anything. And that raises a good point: your brain, your will, and your stubbornness are more important than any physical consideration. I imagine you could put a bullet through my brother Bryan’s head and he’d find a way to finish. If the time cuts don’t get him, that is. Q. I’ve been told that I should “taper” before the ride. What is tapering? A. Tapering usually refers to how much alcohol you should be drinking as the ride date approaches. 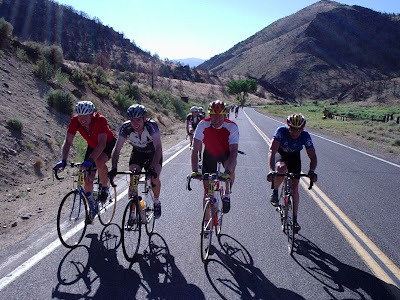 It’s best to do most of your beer drinking about five days before the ride, to build stamina. (If you drink wine, you should stop. It’s expensive, pretentious, and hard on the gastrointestinal system). And as I mentioned before, you should cut back on beer the night before the ride in case it’s hot, so you’re not dehydrated. Some use the term “tapering” to refer to a decline in training duration and intensity. This is useful for big races, especially short ones, but you’ll want as many miles as possible before Death Ride, unless you’ve been training all along (in which case you should take two-three days of active—or passive—rest). Besides, if the snap is gone from your legs, you’ll be less likely to overcook the first couple of passes. Q. About those time cuts. Are they really enforced? Can we realistically make them? Should I calculate my rate of vertical gain for each climb? A. The time cuts can be a problem. They’ve caught out one or more of my brothers and me here and there. Start the ride early, as early as you can, just after dawn if possible. This means waking up in the dark, which won't be hard because rock music comes blasting over the PA system at like 4:30 a.m. 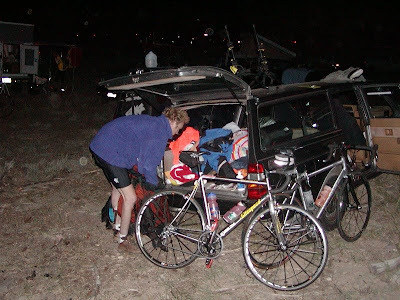 Here, Geoff helps pack up the camping gear before the chilly start to our ride. Also, try not to take too much time at the rest stops. If you go out hard, you might beat the crowds at the food tables and the San-O-Lets. Of course, if you go out too hard, you might blow. What can I say? It’s not an easy ride. As for the calculations, we did this one year, and though it worked out very well—we started the sixth “bonus” pass literally ten seconds before the cutoff—it was fiendishly complicated, as our brains became less and less capable as the ride wore on. Q. Obviously with five mountain passes to go over, there must be a lot of descending. Is it dangerous? Q. I’m trying to get an idea of what the climbs are like. 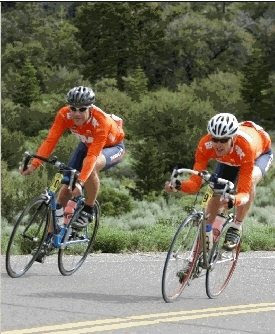 How would they compare with, say, the Samish Way climb in Bellingham, or Flagstaff Road in Boulder, or Mount Diablo in the Bay Area, or the freeway overpass in the Netherlands? A. Whatever you train on just isn’t as long as these climbs. The first big climb, Monitor, probably gains more elevation than just about any training ride you typically do. 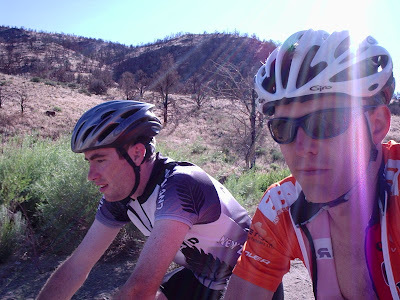 After that the climbs get longer, and of course you’re more tired. The last climb seems endless and cannot compare to anything you’ve ever done in training. Q. How would they rate, given the European categorization method? Q. What gearing should I use for the ride? A. Assuming a standard front chainwheel size of 39 teeth, here's a useful rule of thumb for your largest rear cog: the number of teeth should be equal to your age, minus the number of years during which you raced. 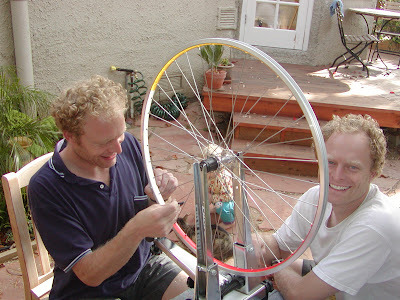 For example, I'm forty, and I raced for fourteen years, so my rear cog should be 40-14=26 teeth. But there’s another rule that says your bike should look cool, so I would stick with a 25 and live with the consequences. In other words, you should use as low a gear as you can handle aesthetically. Q. Wouldn’t a triple crankset be just the thing? A. Let’s see, how should I put this? Don’t be such a . . . um, well, suffice to say, using a triple just isn’t done. You’d have to put up with a lot of mockery from your comrades, and the only way to handle that gracefully would be to drop them. And if you’re strong enough to do that, you obviously don’t need a triple. Q. What about a compact? A. Sure. You go right ahead. Q. I just realized my bike chain is pretty worn. Should I replace it prior to the ride? A. You'll want the normal jersey, sleeveless jersey, shorts, socks, shoes, sunglasses, cycling gloves, sunscreen, and of course your helmet. You should also bring a lightweight rain jacket that can be stowed in your jersey pocket. The temperature can be in the nineties, but snow banks at higher altitudes coupled with common thunderstorms can make things very cold. Q. Besides my bike, what is the worst possible thing I could forget to bring to the ride? A. Your shoes. There is no way you could find a pair of spare cycling shoes that would fit properly and have the correct cleat placement. You also shouldn’t forget your sleeping bag, since you’ll be camping on the cold hard ground and it gets mighty cold up there. Q. Has that ever happened to you? How could anybody be so stupid? Q. Can I plan on driving home after the event? Q. What’s the best medication to use for saddle sores? A. Bag Balm. It's for cows. Dairy farmers rub it on the cows' swollen udders. Because it's designed for thousand-pound animals, it works great on humans, I'm told. 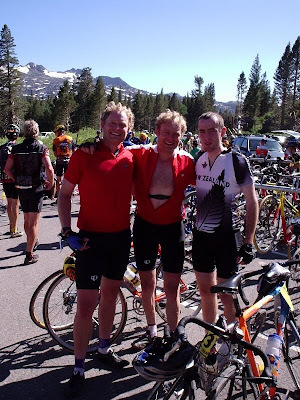 I have only ever had one saddle sore, incidentally--from the ‘97 Death Ride. Q. DMSO, a miracle solvent designed for horses, can chase crushed aspirin directly through my skin into my bloodstream. Should I use this? Q. What medicine can I use for general pain and suffering? A. Advil, of course, and Halls Mentholyptus for after the ride. Q. Will I really need the cough drops? A. Yes, after a ride of this magnitude you will probably not be able to take a deep breath without coughing, and your throat will be very raw. Q. Is it too late to change my mind about this thing? A. Yes. You've already paid your entry fee and besides, you would incur the scathing gibe of your riding buddies were you to chicken out at this point. Q. How did I get talked into this, anyway? A. It was a combination of your own foolishness and relentless peer pressure. Q. I want to ask you something that isn’t on this list. How can I do that? A. Leave a comment below, or e-mail me at feedback@albertnet.us. Speed wobble, my claim to fame! PS I do have a picture of your saddle sore, if you'd like me to send it to you. It's not a pretty site. Two things: 1) A word of caution about that carbo-loading, "bag o' potatoes in a bottle", wizard potion Carbo-Fuel: if you drink as much of this as Dana recommends, then drive from sea level to 5,500 ft and sleep in a tent, there is a very good chance that you will kill your tent-mate with the noxious gas that your gut will produce in copious amounts and then issue forth in ominous clouds that are visible to the naked eye. My wife (then girlfriend) almost died in just such a ill-conceived gastrointestinal/camping experiment, and reminds me almost daily of the abject fear that overtook her as her body instinctively stopped breathing and began shutting down in a desperate attempt to keep the airborne poison from her lungs. At the last minute, I was able to drag her from the tent and into the fresh air, thus saving her life. Needless to say, we slept the rest of the night with our heads stuck out of the tent, and then burned the tent and sleeping bags to the ground in the morning (actually, we didn't burn them -- they self-immolated). Never again. 2) A question for the FAQ: If a person wanted to participate in the Death Ride (or say, a few friendly rides in the Berkeley Hills this October), and that person will be traveling by plane to get to said ride(s), what is the best way to transport one's bicycle? Bry, I think it's really best if we try not to think about that saddle sore and especially not the photo. I trust you've taken that out of your screen-saver slide show rotation? John, I just about died laughing over your Carbo-Fuel closed-tent disclaimer. As for the bike transport question (which I hope isn't purely hypothetical), I think it's probably better to take the bike on the plane than to trust it with UPS (who once damaged one of my bikes and never made good). That said, the airlines charge a fortune these days; never mind that a nice racing bike weighs less than the spare tire on the average American. (I wrote an angry letter to the airline once and got a travel voucher for the amount I'd paid to bring the bike on, and I recycled that letter a few more times until the airline recognized the letter, noted my recidivism, and shut me down.) As far as protecting the bike, you can either get (from your friendly bike shop) a bike box, foam pads for the frame tubes, and plastic braces for the fork & rear triangle, or you can buy (or borrow) one of those "armored" bike carriers (e.g., http://www.coloradocyclist.com/product/item/TRIULZDZ). Not cheap, but then neither is your Orbea.